Keauhou Kona Surf and Racquet Club. Spectacular Oceanfront! This OCEANFRONT complex,adjacent to the Kona Country Club, which has two 18 hole golf courses, sits on 17 prime acres with coconut palms,lush tropical landsacpaes and a grass volley-ball court. We are 5 miles south of Kailua/Kona, 25 miles south of the Kona International Airport and are an easy walk to shopping, restaurants, a multiplex movie theater, and Kahaluu Beach, probably the best snorkling beach on the island! 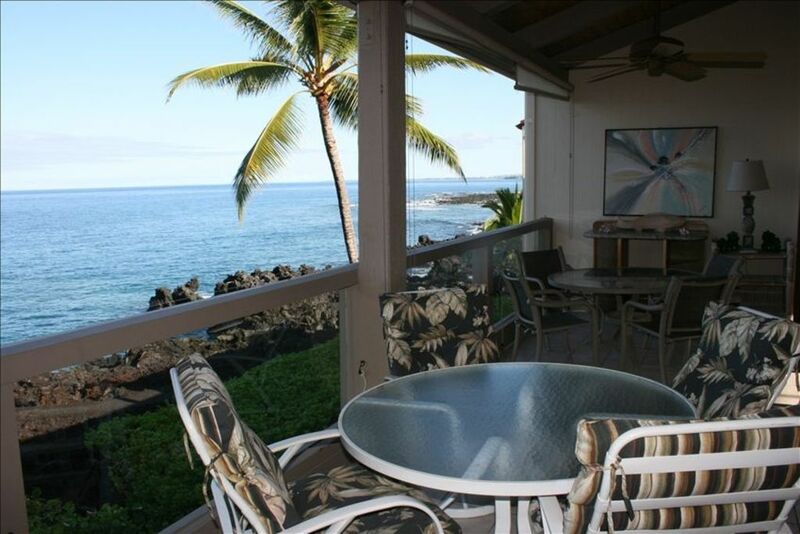 The Keauhou-Kona Surf and Racquet Club is a private, gated, garden-style community. There are three lighted profesional tennis courts (there are no charges for the use of the courts), a large pool with adjacent pavilion, and a second pavilion near our unit with gas and charcoal barbecues and picnic tables. Our two-story unit is on the third (top) floor. Our lanai is 40 feet from the ocean. You will enjoy the beautiful sunsets, whales, dolphins, fishing boats, and kayakers. Our view extends from the golf course for five miles to Kailua Kona. Our condo has high vaulted ceilings and ceiling fans in all rooms a fan and shades on the lanai. It was completely renovated and upgraded. We have new kitchen counters, stove, sinks, and showers. The master bedroom has a king-size bed that looks out at the ocean. The second bedroom has a queen-size bed.The third bedroom has twin beds. Features of this condo include: phones, cable TV, DVD/VCR, stereo/CD, built-in microwave, washer and dryer, electric coffee maker, toaster, hand mixer, fully-supplied kitchen utensils, and linens. We have an unlimited high seed (wireless) CABLE INTERNET MODEM for your laptop computer to give you more time after surfing the web to enjoy Kona. Our second and third bedrooms have TVs as well. VCR/DVD player, Very Fully equipped Kitchen, Brand new Dishwasher, Charcoal and Gas Grills are located in the pavillion in front of the condo. BBQS not allowed on lanais, No Smoking please! Refunds: There is a full refund if the cancellation occurs sixty days before your arrival date. No refund thereafter unless we re rent the unit for the same time. This was the perfect place for our family, very comfortable . Kitchen had everything we needed for our meals, beds were comfortable. Enough space for all 7 of us. Loved having 3 bedrooms and 3 bathrooms. The lanai was great, ocean was right there putting us to sleep at night. Couldn’t ask for a better condo, we all loved it. Amazing!!! It was everything that the owner described!! I would stay there again in a heartbeat!! We loved sleeping and waking up with the waves just outside our window. I love sleeping with the sound of a waves crashing on the rocks outside the open windows and waking up to see the splashing of the powerful swells against the lava. It was quiet clean and met all of our needs. It had little Conveniences like a cooler and two boogie boards that really made our beach day is nice. I actually bought two more boards And left them so now there are four. The only negative was there was no AC and the house was very warm in the evening when it’s closed up all day. We absolutely loved the place. A lovely well outfitted condo. We enjoyed every minute of our stay - despite the worry of hurricane Lane! I would highly recommend it and would love to stay again if the opportunity presented itself. Great set up and amazing views! Looked much better in person than in pictures. Plenty of space and a well stocked kitchen! Excellent location for snorkeling on the Big Island. Huge stock of nice towels and very helpful to have plenty of laundry soap and various toiletries provided. Just wish it had AC! Thank you very much for your wonderful write up of our condo. We hope to be able to serve you again in the near future.